Aberlour, or Charlestown of Aberlour, is a large, attractive village that lies along the south east bank of the River Spey and astride the main A95 from Aviemore to Keith and beyond. 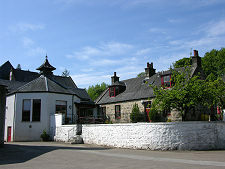 The origins of the village lie at the west end of today's settlement, on the opposite side of the main road from the Aberlour Distillery. Here the Burn of Aberlour flows into the River Spey. The burn is crossed by an ancient pack horse bridge, still standing today only because it was rebuilt for the price of £5 by Robert Duff in 1729. Close to the ancient bridge is the kirkyard and the ruins of St Drostan's Church. Not long after 900, a place of worship was created close to where what was then called the Lour Burn flowed into the River Spey; and on the site of St Drostan's Spring. This later developed into St Drostan's Church, around which grew the tiny settlement of Skirdustan. Over the years the settlement came to be named after the burn whose mouth it stood at, becoming Aberlour. And then, in the oddly circular way in which these things so often happen, the burn came to take the name of the village it flowed through, becoming known as the Burn of Aberlour. 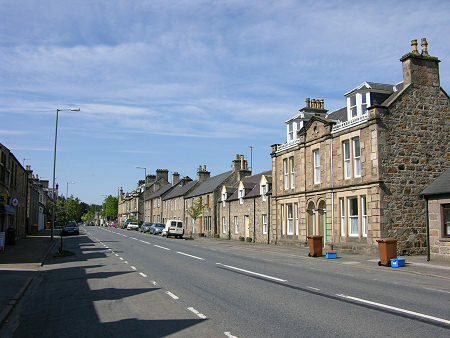 In 1812 the laird, Charles Grant of Wester Elchies promoted a new town stretching alongside the River Spey to the east of the existing village. This he named, with due modesty, Charlestown. Elsewhere in the area there are examples of new names adhering well to new settlements, sweeping away completely the old names they replaced. This never quite happened with Charlestown. 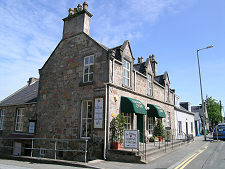 The Ordnance Survey can usually be taken to be definitive on place names, and record the name of today's settlement as Charlestown of Aberlour. 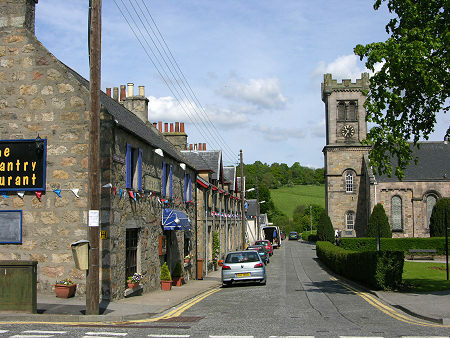 But they are in a minority, because the village is almost universally referred to simply as Aberlour. But while Charles Grant's name may be less prominent than he intended, the beautiful village he designed has stood the test of time rather better. 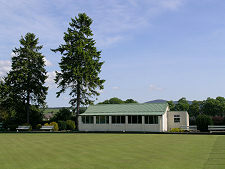 It stretches for almost a mile along the A95, offering passing motorists views of its broad High Street Close, dotted with trees. The focal point for the village is the square that lies towards the south west end of the village. 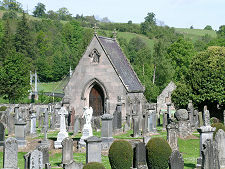 On the side nearest the Spey is the Parish Church, built in 1812 as part of the new town to replace the mean and ancient St Drostan's Church. All but the tower of the Parish Church burned down in 1861, but was then rebuilt with great care. 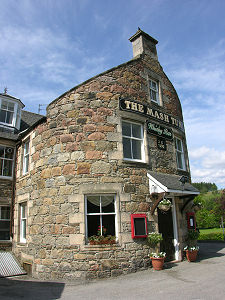 But this is Speyside, so no account of Aberlour would be complete without a reference to distilling. 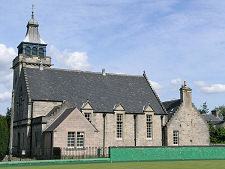 Today's Aberlour Distillery, which is open to visitors, was built James Fleming in 1879, reusing the name of a nearby distillery which had burned down while his was being constructed. The other end of Aberlour is home to a different, but equally famous industry. Walkers Shortbread is the largest independent biscuit maker in the UK, and produces 60% of all the shortbread exported from Scotland: it is also the UK's largest biscuit exporter, serving over 40 countries. 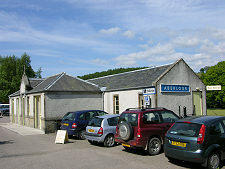 Aberlour was once served by a railway running between the village and the River Spey. 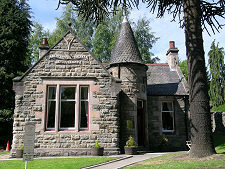 Today much of this has been landscaped into an attractive riverside park, while the Old Station serves as a Tea Room and as the Speyside Way Visitor Centre, reflecting the fact that the Speyside Way runs along the line of the old railway here.